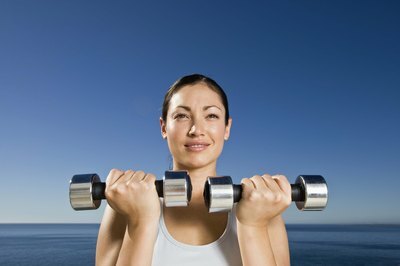 Choose the workout program that can help you achieve your target results. With all of the different training programs out there, it can be dizzying to choose one that will help you trim and tone those trouble areas. Pyramid workouts focus on building muscle quickly while periodization workouts build strength through cycling different types of exercises. To avoid sweating in vain, it is important to understand how each program works, and why it would be best for you. Using pyramid workouts is a strength-training strategy that can be done with any muscle group with three sets. In the first set, start with a lighter weight that you can lift for 12 to 15 reps. For the next set move to a heavier weight that you can lift for 10 reps. For the final set move to a weight that you can only lift for eight reps. Resting time between sets should be no more than 90 seconds and you should take rest days between strength-training days. 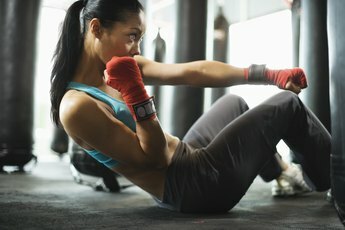 If you do pyramid training, you should also do cardio at least three times a week for 25 to 30 minutes per session, according to Bodybuilding.com. The purpose of pyramid workouts is to help you gain muscle quickly. This is done by tearing down muscle tissue in stages; by the end of the workout you should have maximized muscle breakdown. Since muscle breakdown and recovery is the key to building new muscle, this strategy is often used by athletes and bodybuilders to gain strength and size quickly. This type of training usually leads to bulking rather than toning. Periodization can be used for any muscle group, and is an exercise strategy that works by cycling workouts of different intensities. Cycles can last from days to months, depending on the exercises you do, but the main goal is to plan the cycles so you are at peak performance for competition. When you train, your muscles go through three stages based on the General Adaptation Syndrome. When you first do a new workout, your muscles get weaker as an alarm response to the stress. As they get used to it, the muscles adapt and gain strength. If they are exposed to the stress for too long, they become exhausted and can lose strength. The theory behind periodization training is to change the exercise type, or cycle, after adaptation, but before exhaustion. Periodization can be used to train athletes in different types of sports or by individuals who want to get the most out of their workout time. According to the University of New Mexico, this method is mostly used in resistance training to help avoid overtraining. Periodization can either be done to increase muscle growth or improve muscle endurance. Since many different types of training can be cycled using this strategy, you can tailor the workouts to fit your fitness goals. However, this is a long-term strategy, so you should plan your cycles to fall in line with your goals. Bodybuilding.com: Pyramid Sets - 50 Exercises, 12 Weeks, 1 Transformed Body - Yours!